Lublin Nowy Swiat in Lublin is an apartment building. Located in Lublin, 2.6 km from Lublin International Fairs, Lublin Nowy Swiat offers accommodation with free WiFi. Each unit is fully fitted with a washing machine, a flat-screen TV, a sofa and wardrobe. Some units also have a kitchenette equipped with a dishwasher. A continental breakfast can be enjoyed at the property. The apartment offers a terrace. A bicycle rental service is available at this property. Sobieski Family Palace is 3 km from Lublin Nowy Swiat. The nearest airport is Lublin Airpo...rt, 14 km from the accommodation. 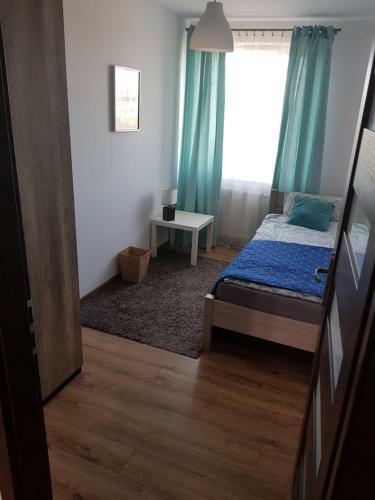 Located in Lublin, 2.6 km from Lublin International Fairs, Lublin Nowy Swiat offers accommodation with free WiFi. Each unit is fully fitted with a was...hing machine, a flat-screen TV, a sofa and wardrobe. Some units also have a kitchenette equipped with a dishwasher. A continental breakfast can be enjoyed at the property. The apartment offers a terrace. A bicycle rental service is available at this property. Sobieski Family Palace is 3 km from Lublin Nowy Swiat. The nearest airport is Lublin Airport, 14 km from the accommodation. 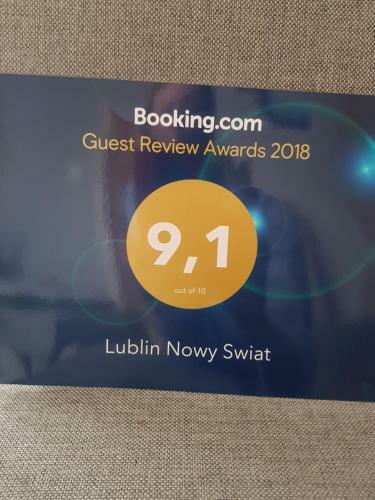 When would you like to stay at Lublin Nowy Swiat? Please inform Lublin Nowy Swiat in advance of your expected arrival time. You can use the Special Requests box when booking, or contact the property directly with the contact details provided in your confirmation. This property will not accommodate hen, stag or similar parties.